There are 2.5 lakh village panchayats in the country. All of them will have broadband by 2012, said Sachin Pilot, Minister of State in the Ministry of Communications and Information Technology in response to a question in Parliament. This initiative will be part of Bharat Nirman, a business plan for rural infrastructure by the Indian government, which also includes a proposed 40% rural teledensity by 2014. The broadband plans will not get any additional funding; but resources have been allocated in various schemes of the Universal Service Obligation Fund (USOF) under which village panchayats are covered, clarified Pilot. Internet Service Providers (ISP) in India do not have any specific rural obligations as part of their license agreements. This means that ISP's here can only focus on developing infrastructure in metro and tier two or tier three cities from which they can expect a better and steadier stream of revenue. The onus of providing villages with Internet access is on the state-owned telecom incumbent Bharat Sanchar Nigam Limited (BSNL) . The company has provided 7.7 lakh connections in rural areas as of January this year. 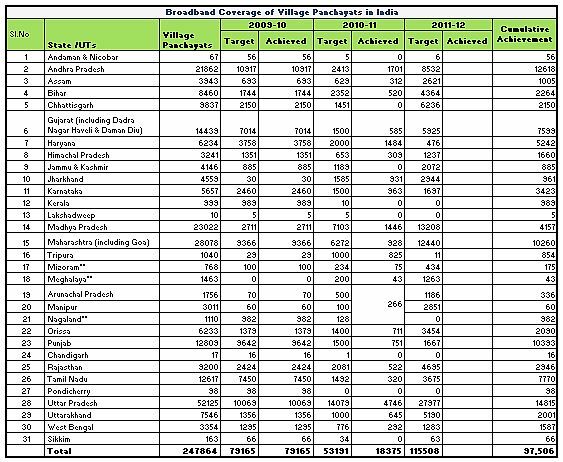 Some 97,548 Panchayats have access to broadband.